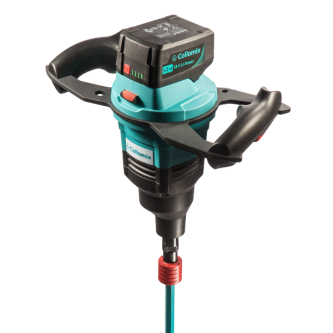 Collomix Xo/Xo-duo hand-held mixers are the newest generation of mixing drills. Optimum performance and perfect ergonomics. That’s what the Collomix Xo/Xo-duo hand-held power mixers are. Easy to operate with a straight back and ergonomically shaped grip handles. State-of-the-art motor and gear unit components for long service and safety while working. 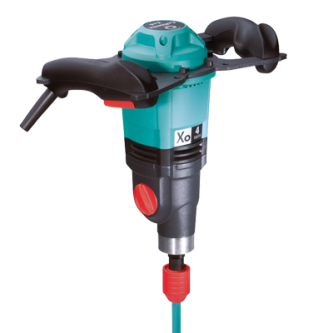 For your safety every Xo hand-held mixer is equipped with a Double Action Trigger (with safety lock-off to prevent unintentional machine start-up). Optimum performance and perfect ergonomics. That’s what the Xo hand-held power mixers are. Easy to operate with a straight back and ergonomically shaped grip handles. State-of-the-art motor and gear unit components for long service and safety while working. For your safety every Xo hand-held mixer is equipped with a Double Action Trigger (with safety lock-off to prevent unintentional machine start-up). With HEXAFIX® tool connection.